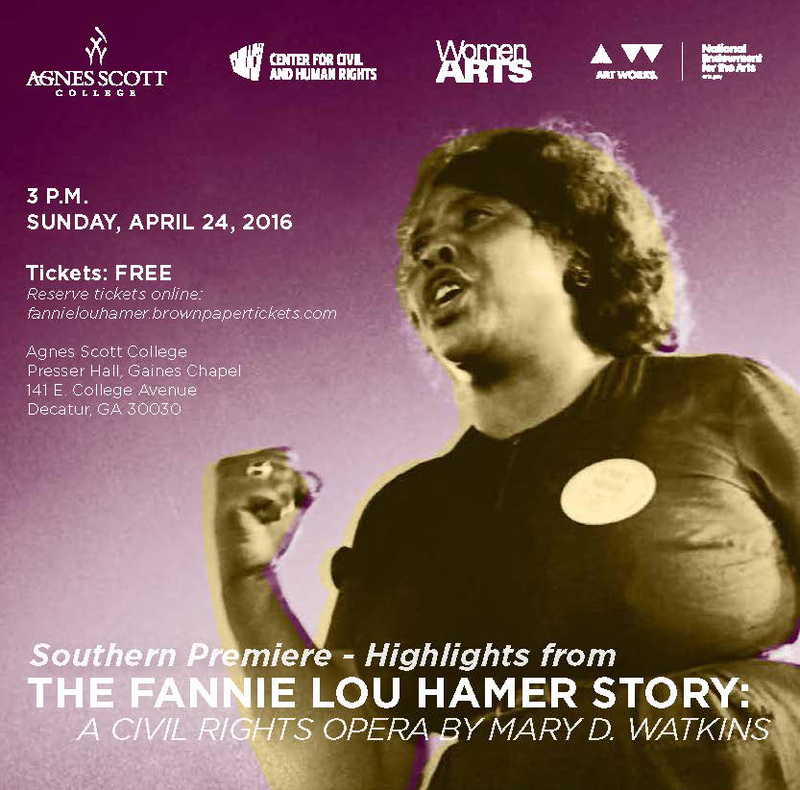 Highlights from The Fannie Lou Hamer Story: A Civil Rights Opera by Mary D. Watkins will be featured in a free concert on Sunday, April 24, 2016 at 3 p.m. in Presser Hall at Agnes Scott College, 141 E. College Ave., Decatur, GA 30030. A reception for the public will follow the performance. The opera brings to life one of the most turbulent periods in American history. Fifty years ago, Fannie Lou Hamer was one of the first African-Americans to register to vote in Mississippi. She became a leader in the Student Non-Violent Coordinating Committee and the Mississippi Freedom Democratic Party and endured death threats, beatings, and imprisonment in order to obtain voting rights for her people. Although Fannie Lou Hamer was the daughter of sharecroppers with little formal education, she became a national leader. Her electrifying speech prior to the Democratic National Convention in 1964 focused national attention on voter inequality. She played a substantial role in the movement that pushed President Johnson to sign the Voting Rights Act of 1965, which outlawed discriminatory voting practices. The opera is especially timely since the voting rights that Fannie Lou Hamer fought for are under attack once again. Also, this opera captures the particular challenges faced by women activists Fannie Lou Hamer had to fight against sexism as well as racism throughout her life. The opera explores Fannie Lou Hamers decision to fight for her rights, her challenges, her triumphs, and the impact of her activism on her husband and children. The opera’s music is a unique combination of classical, jazz, blues, and gospel styles. Composer Mary D. Watkins trained in classical music at Howard University and has written for symphony orchestras, chamber and jazz ensembles, film, theatre, and choral groups, in addition to being a popular recording artist for Olivia Records in the 1970s. Her recent recordings include “Prayer for Peace,” a meditational CD, and “Recorded Music of the African Diaspora” (Albany Records, 2010). Her goal in writing the opera was to find a way of paying respect to the greatness of the ordinary people who suffered and died to bring about change in this country. The Atlanta performance on April 24 will present key scenes from the opera in a concert format. Andrea Chinedu Nwoke from New York and Philip Lima from Boston will perform the roles of Fannie Lou Hamer and her husband Pap Hamer, accompanied by a 12-member chorus and the Agnes Scott College Community Orchestra conducted by Dr. Qiao Solomon. The performance will also include two orchestral pieces by African-American composers, “Soul of Remembrance” by Mary D. Watkins and “Afro-American Symphony” by William Grant Still. This free concert is made possible by a unique collaboration between Agnes Scott College, the National Center for Civil and Human Rights, and WomenArts, with additional support from the National Endowment for the Arts, the James T. and Ella Rather Kirk Fund, the Starry Night Fund, and many generous individual donors.